You've got the single most amazing plot twist in cinematic history. When the reader gets to page 102, they'd better be sitting down, because for the first time EVER, they may actually FAINT reading a screenplay! It's THAT good. It's so good, in fact, you're convinced the reader will forgive any other flaws in the entire script. After all, once they read that twist, they'll be clamoring to buy your screenplay. So why bother formatting correctly -- they can figure it out, can't they? And your first few pages are a bit weak, but they won't remember those, will they? And, yeah, the cover's a bit tattered, but nobody really judges a script by its cover, right? In fact, your FIRST impression is the most IMPORTANT impression. It tells the reader immediately what kind of writer you are: Professional, Hobbyist, Amateur, or Avoid-At-All-Costs! And I'm not just talking proper formatting (that should go without saying!!) 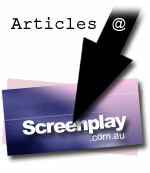 or a clean, simple cover (yes), or a well-presented overall screenplay (a MUST!). I'm also talking about the STORY ITSELF! What's happening on your first page? Is SOMETHING interesting happening? Are you giving the reader a REASON to keep reading? Are you introducing characters we WANT to know more about? ...Are you sure?? Or, are you just throwing the reader into the middle of a conversation, and assuming they'll keep reading because they have to? Are you introducing twenty different characters without any way to differentiate between them? Are your descriptive paragraphs full of boring, trivial detail that tells the reader they're in for the longest, slooooowest ride of their lives? First impressions count. You must make absolute certain that your work is professional, compelling, and interesting to READ (not just interesting to WRITE). It's the first impression that pushes them to the SECOND impression. So if your first few pages aren't polished, dynamic, and compelling, you're giving the reader absolutely NO incentive to continue. Which means they might not even GET to page 102. They may have fainted long ago. Don't let it happen to you. Spend extra time making a great first impression!